Horizontal Vertical Flame Tester The LCX horizontal-vertical flame chamber tester is a fully automatic instrument contained in its own cabinet to maximize the safety of the operator. The LCX horizontal-vertical flame chamber tester is a fully automatic instrument contained in its own cabinet to maximize the safety of the operator. It screening procedure for comparing the relative burning behavior specimens made from plastic and other non-metallic materials, exposed to a flame ignition source of 50W or 500W nominal power. These test methods determine the linear burning rate and the after flame/afterglow times, as well as the damaged length of specimens. They are applicable to solid and cellular materials that have an apparent density of not less than 250kg/m3, determined in accordance with ISO 845. Then do not apply to materials that shrink away from the applied flame without ignition; ISO 9773 should be used for thin flexible materials. 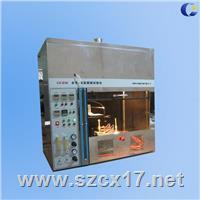 And the combustion test device of plastic materials represented by UL-94. It can perform each test of HB, V0 to V2, 5V and VTM, HBF. Product three type: 50W, 500W, 50~500W mixed-type test equipment. Test flame: 50W (burning test for V-0, V-1, V-2 classification). Burner tube: internal diameter: 9.5mm±0.3mm, length: 100mm±10mm. Burning angle: 0°, 20°, 45°. 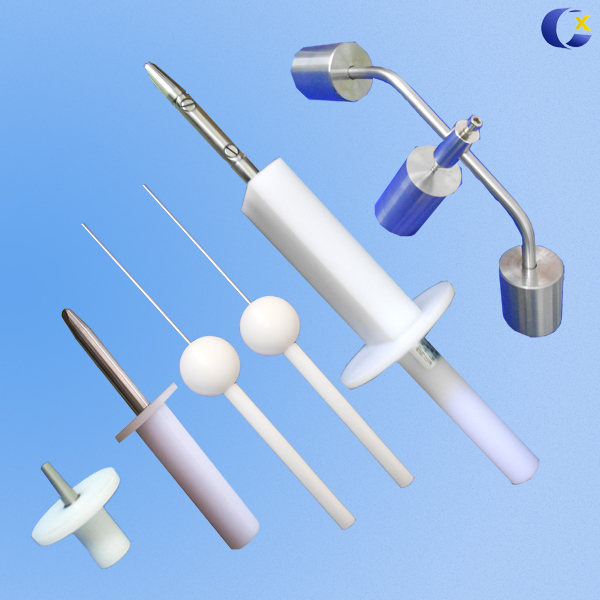 Thermocouple: type K (Ni/Cr – Ni/Al). Standard copper block: 5.5mm±0.01mm, weight: 1.76g±0.01g before drilling. Cu-ETP time for temperature to increase: from 100°C±5°C to 700°C±3°C; 44s±2s (preset). Gas supply: methane, min. 98% purity. Input power: 220V 50Hz 3A or 115V 60Hz optional. Volume of chamber: >0.75m3, black interior. Outer dimensions: W x D x H=1100mm x 550mm x 1100mm. Conform to standard: UL94, IEC 60695-11-4, IEC 60695-11-10. Fitted to the base plate are a flame height scale, a level and adjustable feet. Includes: 50W flame height gauge and 100% absorbent cotton.